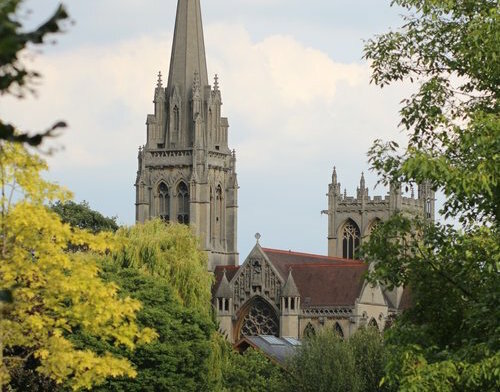 The 2016 conference, co-hosted by MLS and Cambridge University, brought together 160 people, including 80 speakers. The topic was “Revolutions in Private Law” – a theme that considered major changes in the field and the forces that drive them. MLS was well represented among the speakers, with several academics presenting. Professor Elise Bant participated in a plenary session celebrating the 50th anniversary of the ground-breaking restitution text, Goff and Jones’ Law of Restitution. Other MLS academics presenting papers included Associate Professor Katy Barnett, Emeritus Professor Michael Bryan, Dr Rosemary Langford, Associate Professor Jeannie Paterson, Associate Professor Jason Varuhas and conference conveners Professor Andrew Robertson and MLS Professorial Fellow (and Downing Professor of the Laws of England at the University of Cambridge) Sarah Worthington. 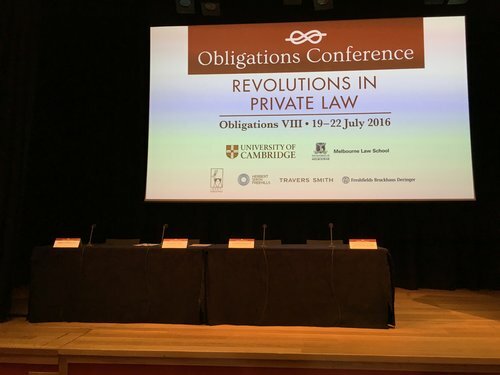 The Obligations Conference series was established by Professor Andrew Robertson, who organised the first two iterations with now Emeritus Professor Michael Bryan in 2002 and 2004. Professor Robertson said he always looks forward to hearing “great scholars and judges address issues raised by the conference theme,” including a discussion this year by UK Supreme Court judge Lord Carnwarth of well-known cases that came before him as a first instance judge. But he also identifies some of the conference’s more intimate moments as memorable. “A great highlight for me this year was an illuminating exchange between Charlie Webb of the London School of Economics, Peter Cane of the ANU and Mark Gergen of the University of California, Berkeley about the nature of the common law, common law reasoning and the role of the legal scholar. The conference brings together academics and practitioners from a variety of countries, and focuses on cultivating international discussion of the law of obligations – a core private law field. “The heart of the conference is the exchange of ideas between scholars working in different, but closely related, subject areas, and in different, but closely related jurisdictions,” Professor Robertson said. Each day of the conference begins with keynote addresses by renowned academics and judges, before moving to smaller, discussion-based sessions. These keynote addresses allow broader trends and developments in the area to be considered, with the smaller sessions facilitating conversations of more specific issues. The conference will return to MLS in 2018, addressing the theme “Form and Substance in the Law of Obligations”. It will again be co-convened by Professor Robertson, along with James Goudkamp of Keble College, Oxford. The conference is to be co-hosted by MLS and Oxford’s Faculty of Law. The conference will reach a milestone in 2020, when it will be held for the tenth time. It will be held at Harvard Law School, marking the first occasion the event has been held in the United States.